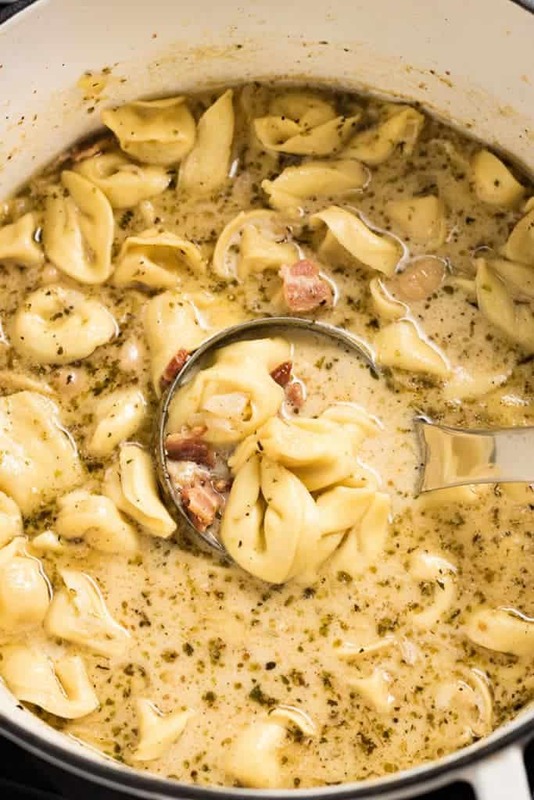 Creamy White Bean and Bacon Tortellini Soup – This creamy tortellini soup is the absolute best soup for fall and winter! Easy to make using only one pot, full of bacon, white beans, cheese tortellini! Ok, you guys. Please allow me to introduce you to my newest soup obsession: Creamy White Bean Bacon and Tortellini Soup. This soup isn’t just “good” it’s blow your mind, knock your socks off, heart warming, soul satisfying, most amazing cold weather soup ever. I’ve seen so many versions of tortellini soup on Pinterest, have made several, this is the one my family loves most. 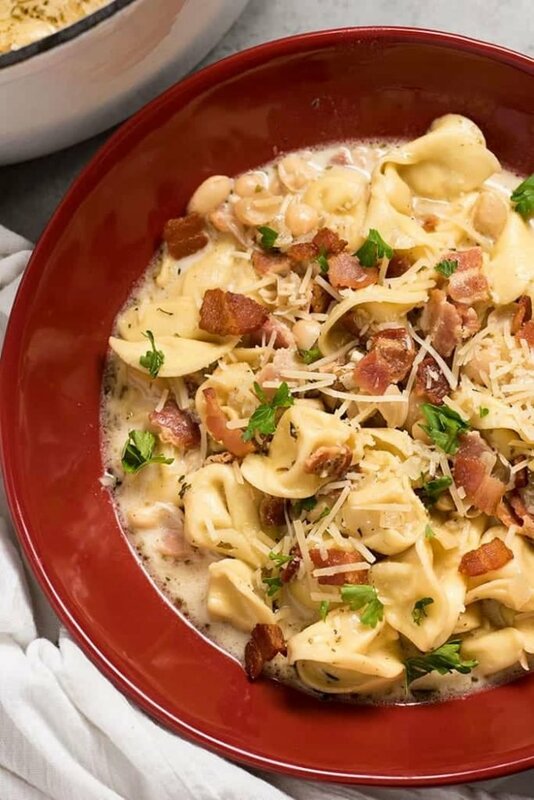 What’s not to love about cheese tortellini, salty bacon, and creamy white beans all in a velvety chicken and cream broth? Not only is this soup really flavorful, it’s all whipped up in one pot for an easy dinner, and super simple cleanup! In the video below I show you how to make creamy tortellini soup, but let’s go over a few things/steps right here, first! Cook your bacon first to desired doneness. But, do cook it all the way through and make sure it’s completely done when you remove it from the pan. Don’t leave the bacon in the pan, add it in at the end. So, you cook your bacon and remove it to a paper towel lined plate while you get your broth cooking. If you don’t, your bacon will end up either overcooked or mushy, and nobody wants that! 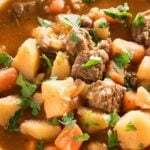 There is no butter or flour in the soup! 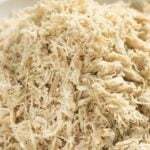 It becomes creamy with the use of heavy cream, which keeps the broth hearty but light. If you’d like you can use half & half. Feel free to use more or other meats. This tortellini soup is great with added chicken, or Italian sausage as well. 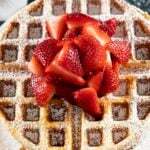 Enjoy, and check out our video for this recipe below! 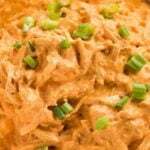 If you’re looking for other comfort food goodness be sure to try out my Crockpot Meatballs and Gravy, Chicken Enchilada Soup, and Million Dollar Chicken Spaghetti! 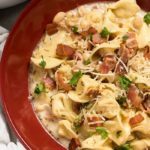 Creamy White Bean and Bacon Tortellini Soup - This creamy tortellini soup is the absolute best soup for fall and winter! 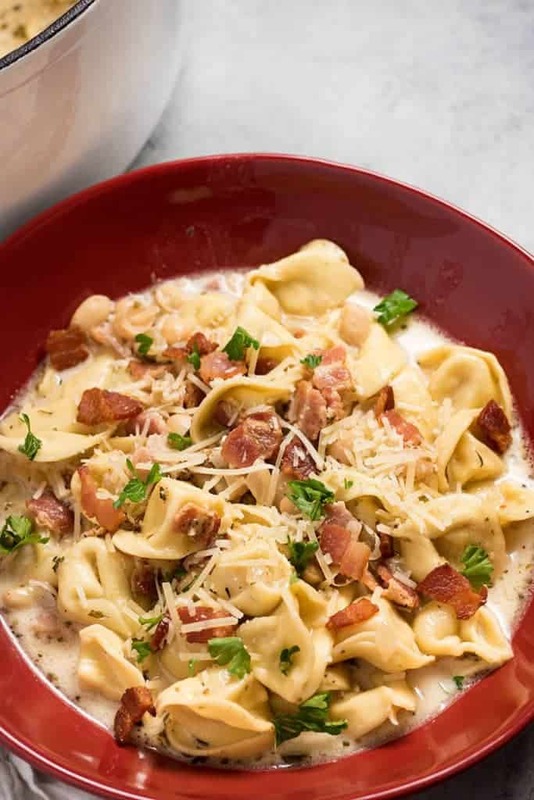 Easy to make using only one pot, full of bacon, white beans, cheese tortellini! In a large pot over medium heat cook the diced bacon. Remove to a paper towel lined plate. Add the onion and garlic to the pot and cook for 2-3 minutes until onion is slightly softened. 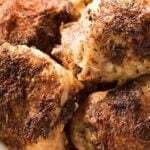 Pour in the chicken broth and scrape the brown bits from the bottom of the pan. Add the beans, cream, and parmesan, and seasonings. Bring to a simmer. Add the tortellini and bacon. Cook for 10 minutes until tortellini is cooked through. Hi there. This soup looks delish!! 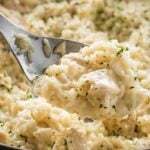 I might be missing it, but when do you add the heavy cream? Same time as broth? Thank you!! I don’t think I’d freeze it with the pasta in it. 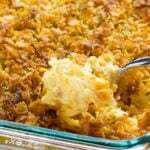 I need to try making this for dinner! I gotta try this soup!! It looks amazing!!! I’m going to make this!! It sounds AMAZING!! White beans and tortellini are two of my favorite ingredients. I can’t even imagine how good they are together in a soup. Bacon makes everything better, and this soup looks super creamy and comforting. Perfect for a cold autumn night. This looks so delicious and satisfying! Yummy! This looks divine! My family would love this! !